Major television networks suddenly cut all coverage of the Occupy Oakland demonstration last Tuesday afternoon just as police in full riot gear began using tear-gas, flash-bang canisters and rubber bullets to disperse the gathering. TheWeatherSpace.com was the first to report the coincidence. "This is not usually something TWS reports on but no other 'media' outlet will," the natural disaster news and custom weather forecast office posted on its site, a weather watch and extreme weather alert service. According to both CBS and ABC news, the helicopters overflying the event had to turn back to station to refuel. "There was a camera on the ground for a full minute," reported The Weather Space. "Showing exploding canisters, people screaming, and gas being covered everywhere and that was shut off shortly after." Without referring to the incidents specifically, Google inexplicably re-iterated its stance on "Google Apps and government requests: enhanced transparency" two days after the events. "Apparently they’ve had requests and/or demands from law enforcement agencies to take down videos," wrote Chris Burns on SlashGear.com. Videos of the incidents taken on cell phones and cameras by individual citizens and uploaded to YouTube are alleged to have been requested removed by law enforcement, "for fear that they would 'defame' law enforcement officials". 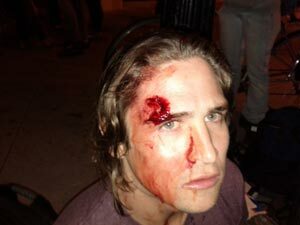 Unconfirmed reports indicate another protester was hit in the head by a rubber bullet, though grazingly and not as seriously as US Marine demonstrator and member of VeteransForPeace.org Scott Olsen, who was hospitalized in critical condition after receiving a projectile to the head. Police are not supposed to be aiming so high with non-lethal weapons. Thanks for the excellent post, Mediaguy! Markgm on Sat, 10/29/2011 - 10:48pm. Mediaguy on Sun, 10/30/2011 - 10:10am. Mike Ruppert addresses those police officers who have begun a campaign of violent and brutal attacks at some of the Occupy Wall Street protesters around the country, and around the world. Joe on Sun, 10/30/2011 - 8:35am. Seems YouTube Pulled the Video? A Message to All Police Officers From Occupy Wall Street from CollapseNet.com on Vimeo. Mediaguy on Sat, 12/14/2013 - 12:50pm.